Although dental caries (tooth decay) is largely preventable, it remains the most common chronic disease of children aged 6 to 11 years (25%), and adolescents aged 12 to 19 years (59%). Tooth decay is four times more common than asthma among adolescents aged 14 to 17 years (15%). Once established, the disease requires treatment. A cavity only grows larger and more expensive to repair the longer it remains untreated. Less than 1 of 3 children enrolled in Medicaid received at least one preventive dental service in a recent year. Many states provide only emergency dental services to Medicaid-eligible adults. Many adults also have untreated tooth decay (e.g., 28% of those 35 to 44 years and 18% of those 65 and older). CDC recognizes community water fluoridation as 1 of 10 great public health achievements of the 20th century. Community water fluoridation still prevents tooth decay even though people now also get fluoride from other sources such as toothpaste, rinses, and other topical applications at the dental office. At present, 69% of individuals on public water systems— more than 184 million people—are receiving the benefits of community water fluoridation. Children receiving dental sealants in school-based programs have 60% fewer new decay in the pit and fissure surfaces of back teeth. (90% of decay is in pits and fissures). School-based sealant programs provide sealants to children unlikely to receive them otherwise (e.g., children in low-income households). Children of racial and ethnic minority groups have twice as much untreated decay in their permanent teeth, but only receive about half as many dental sealants. Thirty-six states reported dental sealant programs serving 258,000 children. This number, however, represents only about 8% of lower income children who could receive sealants. Every dollar spent for community water fluoridation saves from $8 to $49 in treatment costs depending on the size of the community. Savings are greatest in large communities. Fluoridated water saves more than $4.6 billion annually in dental costs in the United States. 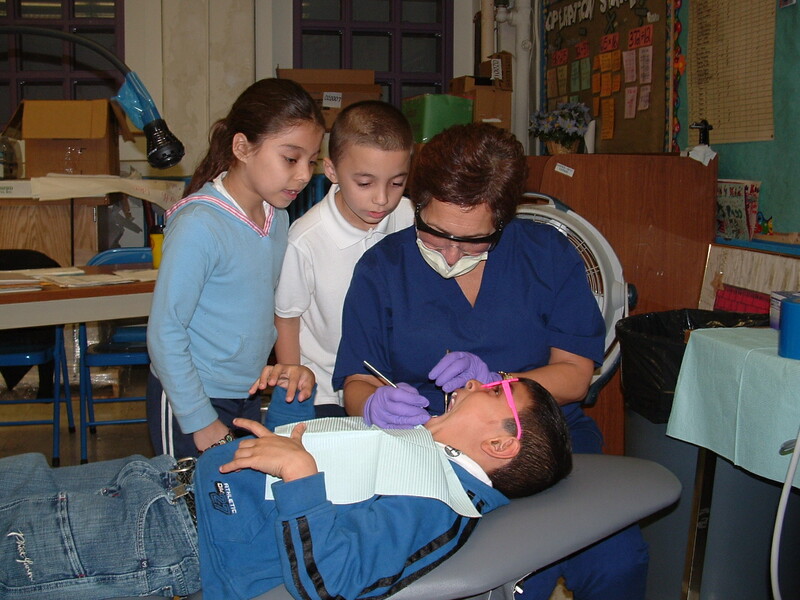 School-based dental sealant programs are cost saving when delivered to populations at high-risk for tooth decay, such as children in low-income households. Many Americans now enjoy markedly better oral health than did their parents. However, certain segments of the population (e.g., those who are poor, who are members of racial or ethnic minority groups, or who are elderly) still have severe dental decay, much of which remains untreated. Healthy People 2010 objectives seek to eliminate these disparities, so that all Americans receive the benefits of good oral health. Community-based programs such as community water fluoridation and school-based dental sealant programs are a particularly effective and cost-savings way to help achieve this goal. For example, increasing the percentage of children at high risk for tooth decay who participate in school sealant programs to 50 % would prevent more than half of the caries that these children would otherwise have and save public health dollars. The above information was obtained from the Centers for Disease Control and Prevention at: http://www.cdc.gov/OralHealth/publications/factsheets/dental_caries.htm. Infrastructure Development Tools, Centers for Disease Control and Prevention. Proven and Promising Best Practices for State and Community Oral Health Programs (Reports and Examples), Association of State and Territorial Dental Directors. Guidelines for State & Territorial Oral Health Programs, Association of State and Territorial Dental Directors, 2010. Healthy People 2010: Progress Review Focus Area 21: Oral Health, Office of the Surgeon General and the U.S. Department of Health and Human Services, 2008.